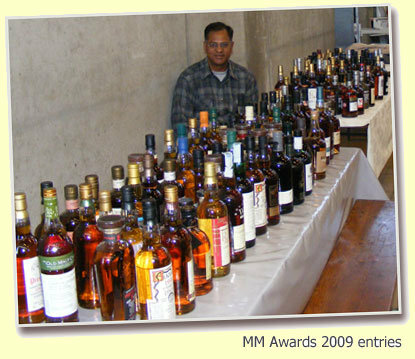 Another year to fetch the Malt Maniacs Awards samples, and just like in the past, I have decided to go personally to get them than to risk with Indian customs. But this time I have two friends to accompany me. Rama Rao and Bhaskar Reddy – my old buddies from Bombay. Olivier suggested that the best way to come to Turckheim would be via Basel as Turckheim is only half an hour drive from there. Now that Switzerland has become a Schengen country, entry from Switzerland to other European cities also would not be a problem. As usual, Davin, my permanent room partner agreed to join me at Paris. We shall be together for three days. After an uneventful journey, and picking up Davin from Paris who had already arrived there an hour before, we finally arrived in Turckheim and hecked into Hotel Du Clefs in the center of ancient Turckheim. Without wasting any time we headed towards Olivier’s place. As many of you know, Olivier’s place is a short walk of 15 minutes from the center of Turckheim. The full harvest of grapes was not yet over and bunches of juicy grapes were still hanging from the road side vines and it was a feast to my friends’ eyes who have never witnessed such a spectacle. What should have been a 15 minutes’ walk took more than 40 minutes; on the way we indulged in stealing grapes from vineyards and plucking over ripe plums, figs and almond hanging out of back yard of Olivier’s garden. Never had I tasted such sweet, luscious plums and figs in my life! Finally we were at Olivier’s place to announce our arrival to Olivier’s secretary. It was peak working time of the year as we could see from Olivier’s get up when he came out of his office. With muddy trousers and dirt laden, large working shoes, Olivier looked more like a seasoned farm hand than one of the finest wine makers in the world. With usual fashion Olivier greeted us with all his warmth. It appeared that Vintage 2009 (odd years are usually good vintages) has been very good which kept Olivier very busy till late September and the Awards samples which me and Davin planned to pick up from Olivier were not ready. Added to the problem was that the Belgian exporter who usually sends sample bottles had not yet sent them. At once Davin and me were crestfallen and thought that our whole journey was a waste. Olivier calmed us down by saying that there were enough bottles for me and Davin to take our samples back. We were relieved to hear the news and Olivier fixed the filling party for the guests for next day. We were on our way back to hotel and just when we were trying to steal some more fruits on the road, Serge suddenly appeared from nowhere in his huge Mercedes. It was such a pleasant surprise and I was extremely happy to meet him after three years. He took us directly to his home and into his cellar. Serge’s cellar is directly below his garage where he routinely makes the yearly moonshine from the left over Gewürztraminers. What an excellent cellar Serge has! 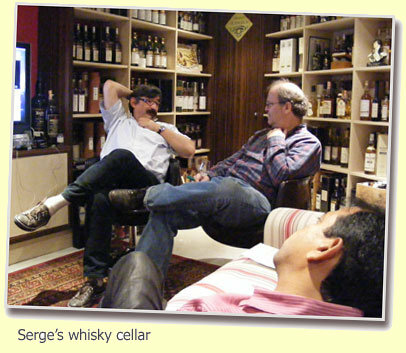 Also this is the den from where Serge operates his www.whiskyfun.com. My two Indian friends were spell bound as they had never witnessed an assembly of such fine whiskies. Serge threw open his cellar and announced “guys, you can drink anything from any bottle that is opened”. Serge has very interesting collection; actually you need a good part of day to go through them. Eventually Davin and yours truly settled for some interesting Diageo samples to get them on to the monitor. Davin also scored more or less in similar fashion. It was a brilliant tasting session in Serge’s cellar. Thanks a million, Serge. Well, not exactly though, there was more to come as he invited us for a taste of local cuisine in the evening along with his friends and family. It was at Francois Baur, an ancient restaurant having it own wine in the center of Turckheim. I had Pig knuckles with sauerkraut which was exceedingly delicious and was washed down with generous amounts of gewürztraminer house specialty. It is filling day at DZH. The labourers began work just before 10 a.m. The work begins with opening of Solan No1, a blended whisky yours truly brought as a surprise gift for the Malt maniacs of the filling party. The skepticism shown initially by the experts (Olivier, Serge and Davin) suddenly vanished when the IMFL (Indian made Foreign Liquor) was tasted which gradually turned into sincere appreciation. When the price of the bottle was announced by me (Less than a Euro for 350 ml) everybody went gaga over the stuff. Olivier went even to the extent of calling the company in India (there is a telephone number on the bottle), but there was no answer from the Company. Since there are 4 scorers, the ratings for the bottle would be put shortly on the matrix. The 206 Awards participants soon were trollied down by Olivier in to his large filling hall and immediately, the work began. At the same Olivier brought several bottles of HPs from his favorite collection and two stunning Red wines from Volnay village in Burgundy (more of it later) dating back to 1976! Well, that is Olivier for you. The four HPs were of highest class as you can see from the scores. Then there was also a stunning Parker’s Port Ellen brought by one of Olivier’s assistants from Scotland. The Port Ellen 1982/2007 (56.8%, Parker’s Whisky, 140/220 Bts) scored 93 points. We had lunch prepared from Olivier’s house and the two red wines from Volnay were consumed liberally. Towards late afternoon, the filling was over and Davin and me had the 206 samples distributed securely in to three packages for each one to carry back home. The celebrations never end during weekends in Turckheim, especially when there are overseas guests. Serge had a Bordeaux wine tasting session at his house where he invited his local friends and asked us to join. The game is that each one brings a Bordeaux with the bottle covered in tin foil and all have to taste and rate them to declare the winner of the evening. I am not much of a wine taster, but who cares? You have come to France to enjoy the best time of your year! The evening seemed to go on forever with uninterrupted food, wine and lots of French conversation. After two days of unrelenting partying we decided not to disturb Olivier and Serge and instead planned to explore Turckheim and the neighborhood on our own. 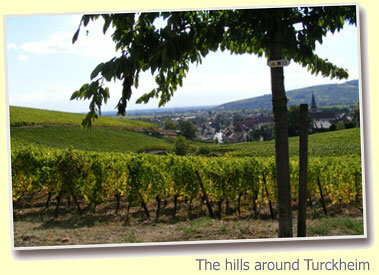 So we set out into the surrounding hills of Turckheim sprawled with undulating wine yards owned entirely by the locals. The best of the wine yards face south to quench the thirst of sunlight and needless to say, Olivier’s Grand Cru/s are situated in some of the most strategic sunny slopes surrounding Turckheim. Afterwards we had a small trek towards Niedermorschwhir- a picturesque village of about 500 inhabitants and just when we were reaching Turckheim Serge caught us again. He insisted that he we should see more of the local villages around and set out in his Merc. First we visited a company called Gilbert Miclo which makes distillates out of local fruits, but unfortunately it was closed and all we did was to take few pictures from outside. Then we headed to a small museum “Musee Eaux De Vie” in the village of Lapourtroie where some interesting gathering of vintage stills and all and sundry equipments related to distillation were displayed. The sightseeing ended with a short visit to Colmar. On Monday we departed. Davin headed back home while we headed towards Dijon for a small wine exploratory tour of Burgundy. Since childhood I was fascinated by Burgundy. With idyllic scenery of forests, crystal clear streams, rolling hills and sleepy villages, Burgundy has it all. Since time was short we settled down to explore a small streak of land between Dijon and Beaunne- well, very small streak by area, but the most expensive piece of land on earth, for here you find about 6000 finest wine growers in the world some owning as much as 200 acres and others a few square yards. The pick of the wine yards is Romanee Conti, having mere four and half acres of land but producing the rarest of wines in the world. Word has it that one has to book a case years in advance with astronomical price. Then we headed to Beaunne, the capital of the wine country but on the way we passed the Close de Vougeot, the famous castle of 12th Century which is now a cooperative of 80 owners each producing as little as 1000 bottles of Grand Cru in the region surrounding the castle. 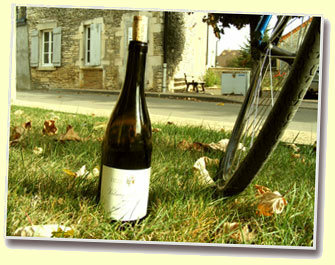 We hired bicycles in Beaunne to explore more and headed towards the villages of Meursualt and Volnay. This was not because we wanted to visit these places in particular, but because these were at shortest distances from Beaunne and we had no confidence on our biking ability. As we entered Volnay, we came across a vine farm selling its wine. We called the house lady and bought a bottle, which happened to be the same brand of wine Olivier treated us with on the filling day. I opened the bottle and asked the lady to point out the direction of Close de Vougeot. She pointed. I turned myself towards the direction, kneeling down I took the bottle in both hands and had a sumptuous swig.